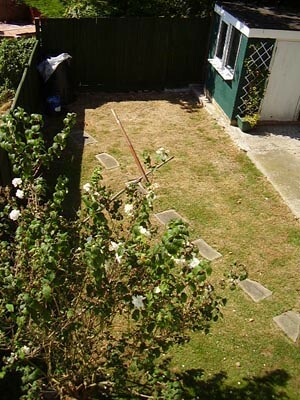 In July 2006 we moved in and the back garden was a postage-sized blank. 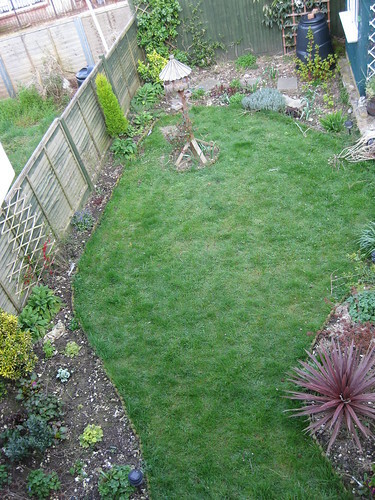 One half was mostly grass, the other looked like a concrete driveway. 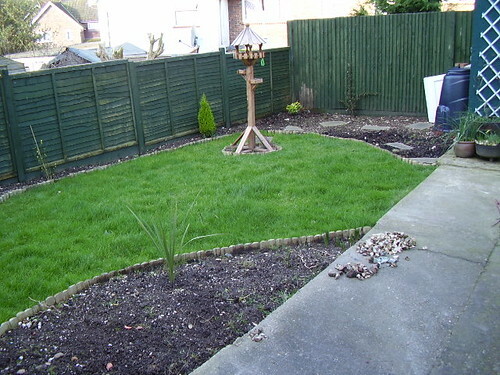 There was a metal pole in one corner to support the washing line with a row of stepping stones underneath. Closest to the house was a scraggy old bush that blocked the view from the back window and wasn't that attractive. The grass was pretty dead. It was a very hot summer and we assumed that the tree in the neighbours' gardens were causing the problem. We had a few house things to be starting with, so the garden got left until November 2006. We wanted a bit of a curve on the lawn, and initially I laid out a set of fairly shallow beds all the way around the edges. It wasn't until we got round to the back bit where the turf had really struggled in the summer that we hit something. 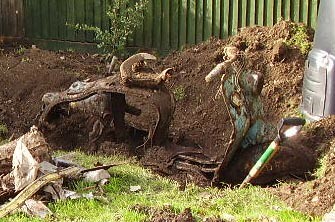 Took us another couple of weekends to get it all dug out properly, and it turned out to be a buried scooter (amongst other assorted rubbish)! Digging that thing out really scuppered my thin beds, and resulted in much deeper ones instead. It also named that back bed - henceforth known as the scooter bed! We relocated the stepping stones from the lawn to that large back bed so they can be used to reach the compost bin and most of the bed, and used the turf we dug from the bed to fill in the holes in the lawn. Come Christmas I received a birdtable, which was given its own little island bed in the lawn. The stepping stones also let me get to that in the winter without getting wet feet. From there until... oh... May 2009, it was a case of trying to fill the beds with plants! Mostly the back garden is ornamental, but there are a few edible bits in there. I've got some autumn raspberries from my Dad, and a small espaliered apple tree that I'm training on one of the fence panels. 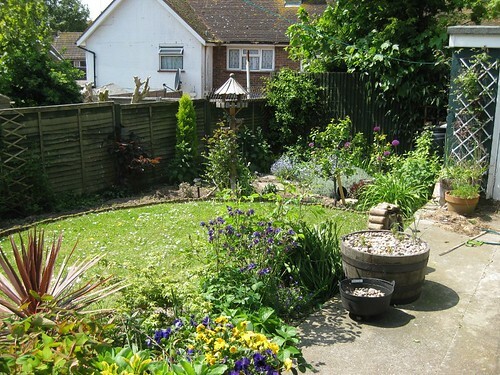 I was pretty pleased with the back garden last year. We're seeing more birdlife and other wildlife too. The plants have come from a variety of sources. Quite a lot were bought in the end, but a fair few were propagated from my parents' garden, and some I've grown from seed. Some have been more successful than others. A green cordyline died, the slugs and snails have massacred a few things. Some things went into slightly the wrong spot. 2009 has been a really good year so far. The monthly photos have shown the structure of the garden is going pretty well, and there is something flowering out there all through the winter. Thing is, we were getting a little frustrated about the state of the grass, and mowing around that island bed was a pain. And I'd spotted another tree I wanted, and had no space to put it. So we extended that scooter bed, and the thin shady bed next to the fence. The lawn is now pretty small, but it still takes the sunlounger so it's fine. The new tree is a greengage tree, so next year that should give us more fruit. More trees should hopefully mean more birds too! The concrete still needs more work, and there's still plenty more space to fill in the beds. It's a long way from done out there, but I am extremely proud of what we've achieved so far. Fingers crossed it will just keep getting better!